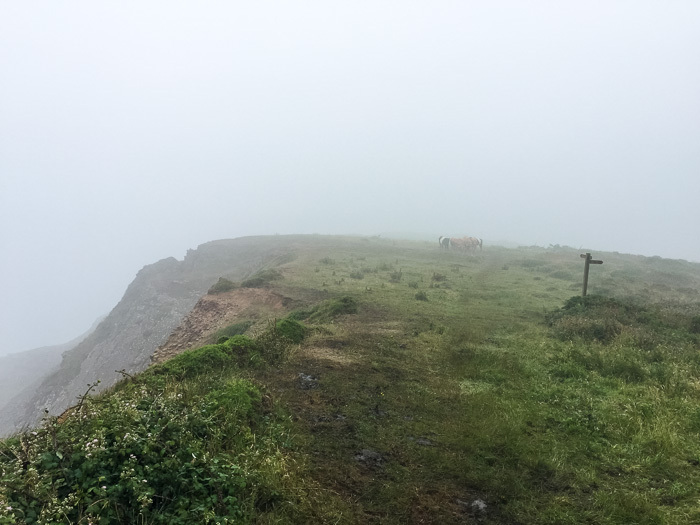 Strapping on our boots and ‘can-do’ attitude my sister and set off just before 9am down the crumbling earth steps to the cliff path swathed in a heavy sea fog. We were still in shock, having discovered the night before, over a plate of fish and chips in the pub, that our second day’s hike of 15.2 miles (24.5 km) was “the toughest part of the entire South West Coast Path and involves a long hard day of walking, with some very relentless and tiring ascents and descents”. Buoyed up by an excellent breakfast, we descended to the start of the rocky coastline with black corrugated spines of rock forming dramatic lines up the beach, inspiring awe even through the mistiness of the day. The reason for the arduous yet splendid nature of the path are the river valleys that carve they way through the cliffs. 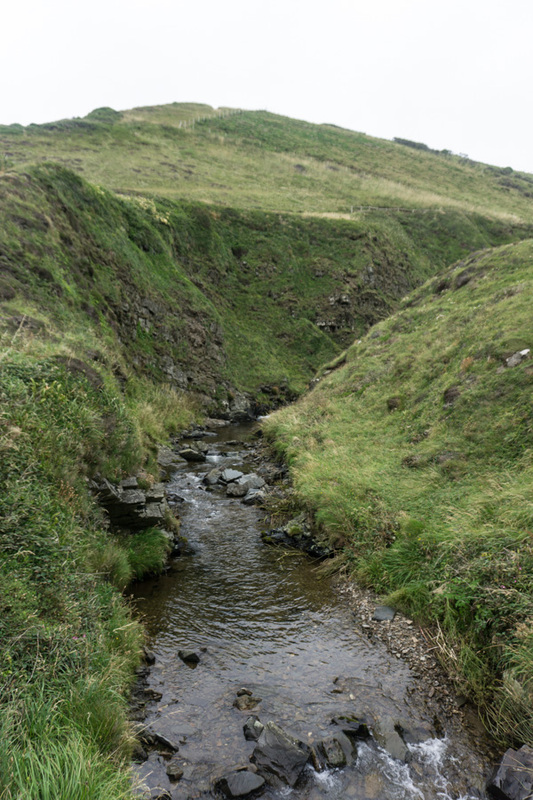 We didn’t see a soul – excepting various breeds of sheep – as we trod carefully down steps in the crags, crossed the rivers on little wooden bridges and then paced doggedly up the other side. Remote and other worldly, this is far from the image of gentle rolling countryside that thoughts of Devon usually inspire. An elegant waterfall at Spekes Mill Mouth, a long streak of teaming water thundering down black cliffs, caused us to stop to admire and catch a breath for a minute before forging on. 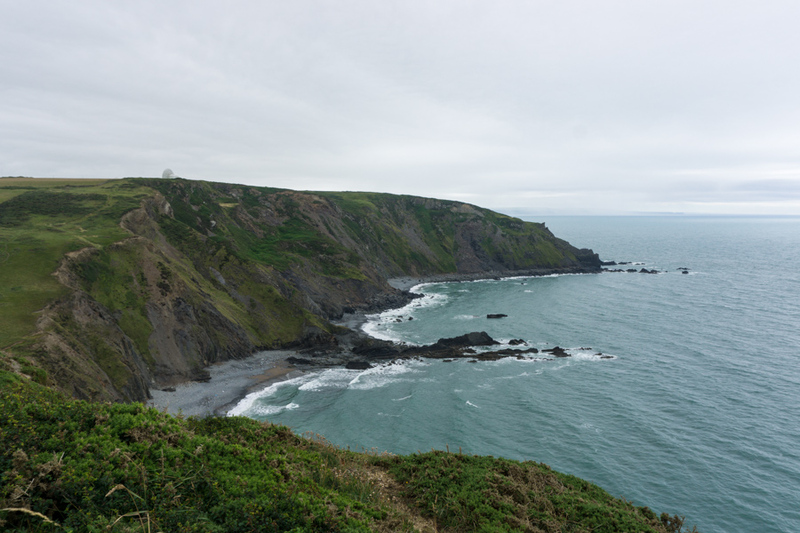 At one point we could look back and see right along the coast to Hartland Point but mostly concentrated on the winding path along the headland and tip toeing down the valleys and then puffing back up the other side. My strategy for tackling the hills was to do 50 steps at a time and then take a breather. This doesn’t sound like a lot but the gradient and distance was pretty tough. Near the top of one steep-sided valley we found a hut with a welcome sign to enter. It was where the playwright and poet Ronald Duncan used to write and there were some pens and paper on a small table in case you were so inspired. It was still a bit misty but thankfully no rain as we crossed a little stream over yet another wooden footbridge at Marshland Mouth and crossed from Devon into Cornwall. 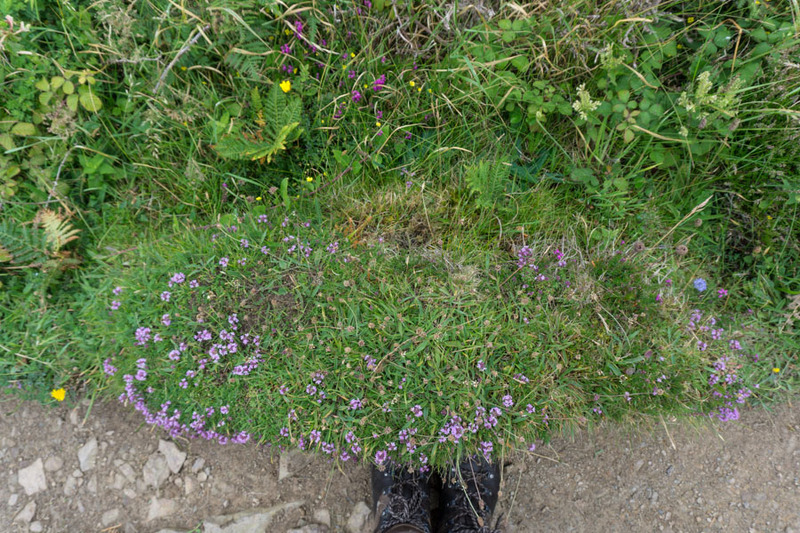 The wild flowers throughout the walk were a joy and wild thyme scented our journey as our boots crushed the leaves under foot. My sister, who had an ornithology book fixation as a child, identified a little bird in the hedgerow as a stone chat. Super impressed – I had never even heard of one. We marvelled constantly at the rock formations; the movement of the earth in prehistoric times and layers of rock evident in spectacular zigzag folds. 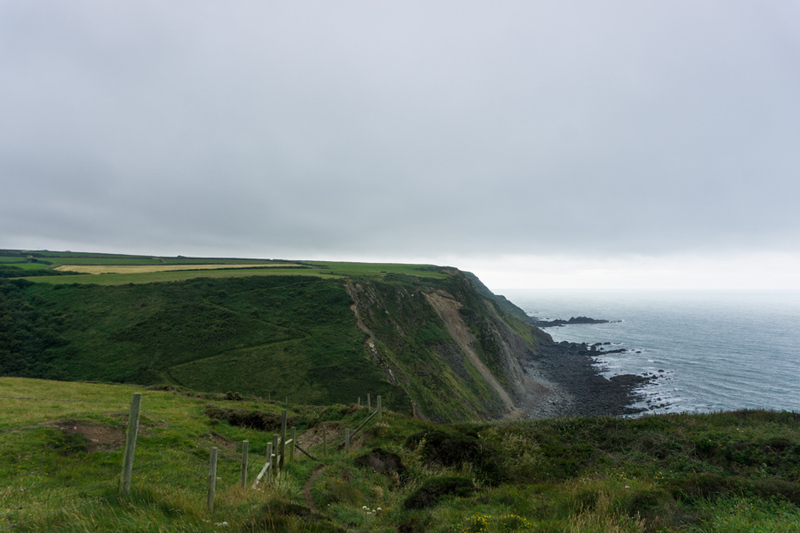 Vicarage cliff was another steep climb and we could see across to Morwenstow at the top, home of a fabled tea rooms. There was no time for us to stop though so we carried onto another little hut, made of driftwood, just off the path looking out over the Atlantic. Hawker’s Hut is the smallest property to be owned by the National Trust and the place where local vicar the Reverend Robert Hawker would write poetry under the influence of opium in the 1800s. Under the influence of big floury baps with ham, cheese and homemade runner bean chutney for our lunch (made by B&B landlady Anna) and the breeze on our feet, liberated from their booted confines, we were very soon restored and set off again at around 2.30pm. Feet breathing inside the hut! We were not liberated from the hills and valleys however, some steep some a little more gentle, and needed to keep our spirits up. A flatter respite took us past the wire fence and huge dishes of a satellite tracking centre where the path was covered in little flowers. There were a few more people on this section of the track as it can be reached from inland paths to make circular walks. We stopped to chat to a young chap walking his way round the whole of the UK. 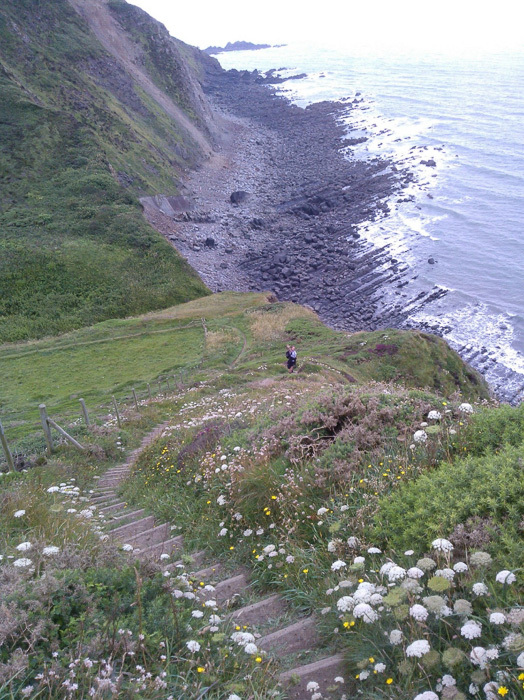 A winding very steep path to Duckpool beach had my sister’s heart palpitating as she hates precipitous views. We got to the bottom and I was very pleased to see… public toilets; a luxury as the first we had seen on our two days of walking on this remote and beautiful coastline. 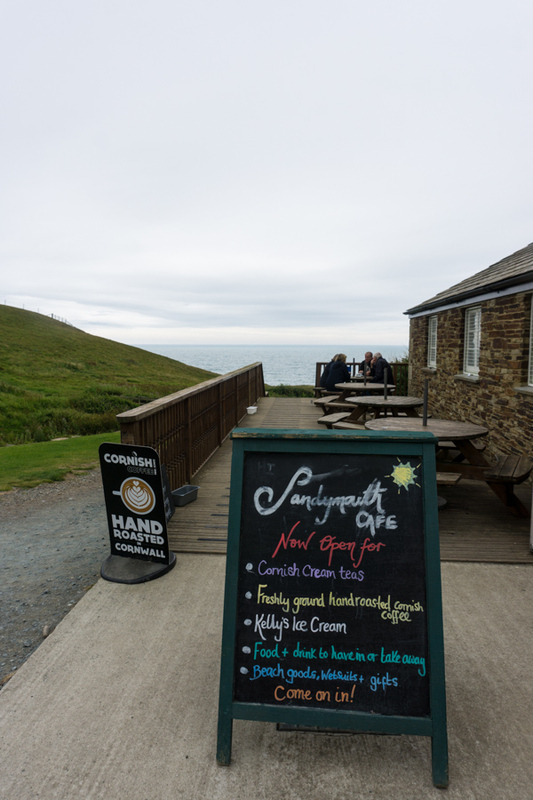 Another couple of steep up and downs brought us to Sandymouth where we just caught the cafe for a cup of tea as it was closing. 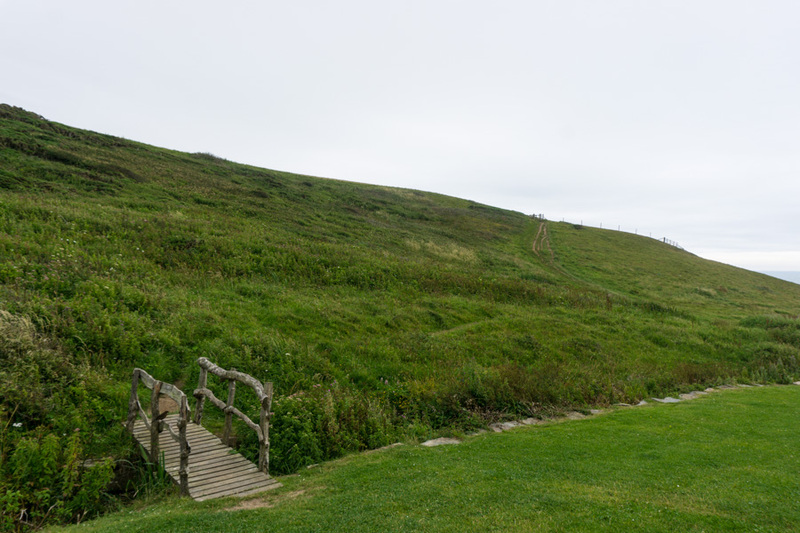 After making our way back up to the top of the cliffs we strolled along the wide path with expansive views over to Bude which got nearer and nearer. The multi-coloured beach huts offered the jolliest welcome and it was a real effort to move my feet onto pavements and into Bude to find our Bed and Breakfast. If I could have hailed a taxi then, I would have thrown myself in front of it. We cheered as, when given a friendly welcome by Joanne at Teeside (opposite Bude golf course), she told us that our room was on the ground floor. No more stairs to climb – hooray – and a really excellent hot shower. Supper was at the Olive Tree sitting overlooking the canal. The inside dining room was fully booked but you can pitch up and order for the bar area and outside tables, and after looking inside we thought the latter was by far the best option. The menu was good, food delicious but, apart from one sweet waitress, the service was disinterested to the point of rude. However, this didn’t spoil our evening watching people drift past by water and on foot. 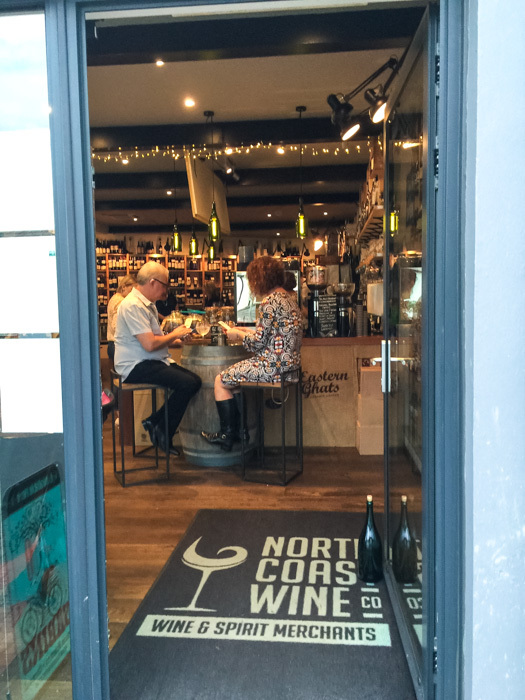 We topped off with a cocktail in North Coast Wine Co as we called it a night and shored ourselves up for the next day walking from Bude to Crackington Haven. We were absolutely exhausted, aching all over, exhilarated from having conquered such a challenging leg of the journey and rather worried that our battered feet and legs would make the next day’s route. Did I mention it contains the steepest and longest descent and ascent of the entire path? 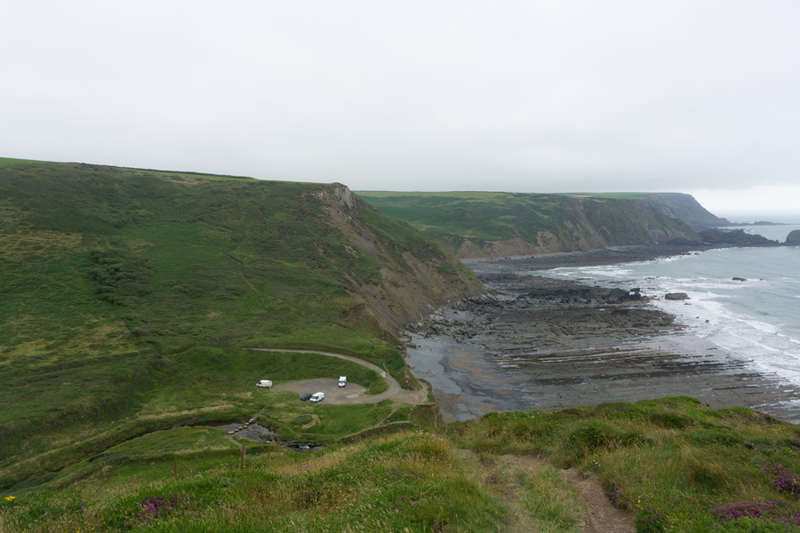 Our next (third) day’s hike was Bude to Crackington Haven (having hiked from Clovelly to Hartland Quay the previous day). What’s the most spectacular coastline you’ve ever visited? I’m sure for some people it was too arduous but it certainly tested us to the limit. Great sense of achievement afterwards. Part three to follow soon – thanks for joining us from your armchair Celia. 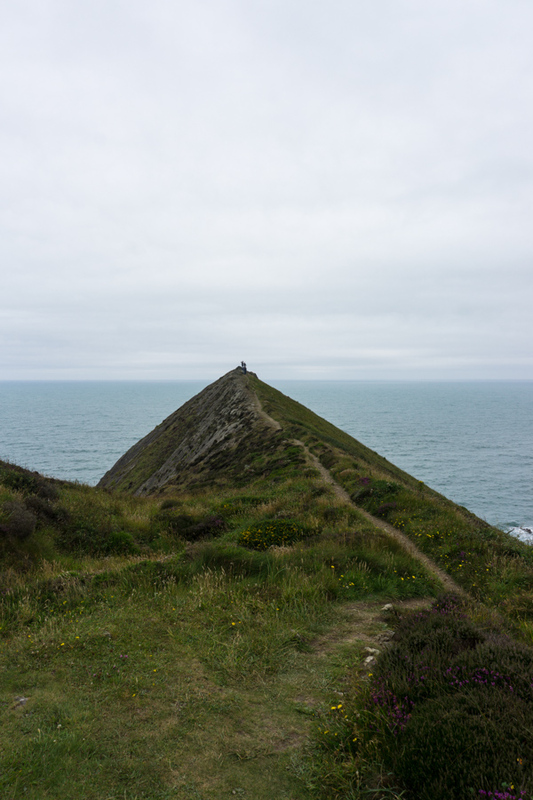 Have just enjoyed tiny sections of the coast path in Norfolk – a lot flatter than this stretch! Sounds wonderful though, really fancy attempting it. I did a very flat section last weekend, but the craggy, testing, dramatic bits have me hooked. Would like to do the whole path. 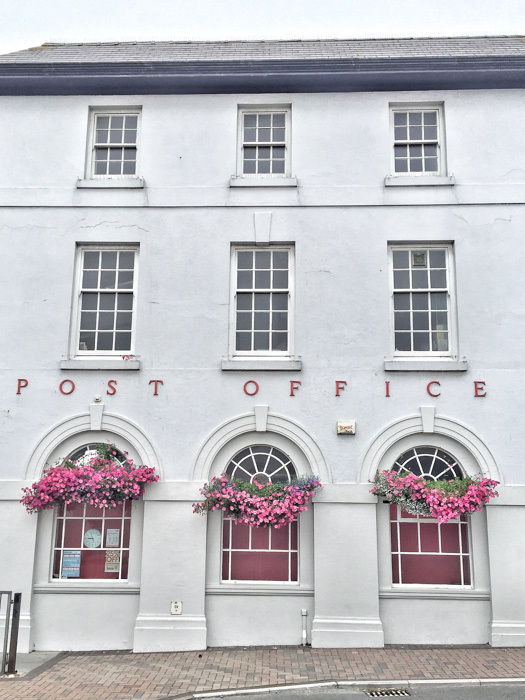 See – still getting it wrong! Perfect walking companion. 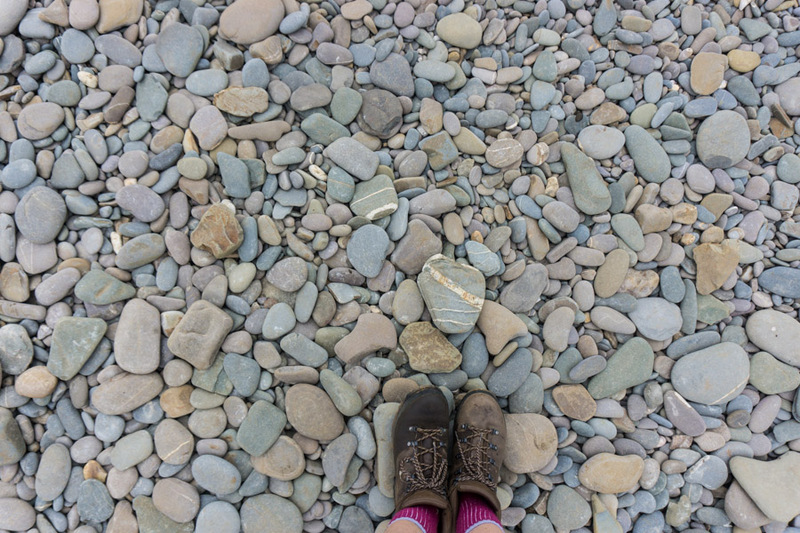 Love these posts Sally – especially as I plan to walk the whole of the South West coast path over the next 10 years! Me too – now hooked. I’ll join you for a section if you want. This bit was tougher than anything Lebanon threw at us! Lincolnshire is a county I know nothing about whatsoever. Some friends live there and a long lost Aunt. Where do you recommend walking there? So much of the British coastline to explore. I’ve heard great things about walks in Wales and last year’s hikes with my sister were in the Brecon Beacons which was stunning. Will you return anytime soon Tandy? There must be some amazing hiking where you live too. I can’t get enough of it when I’m back home Katie. Do you like to hike? Where are your favourite places? I’ll tell you – I felt like I’d old lady after this! The aches do take longer to go than they used to – but I feel stronger for it now… worth the pain and the views helped to distract. 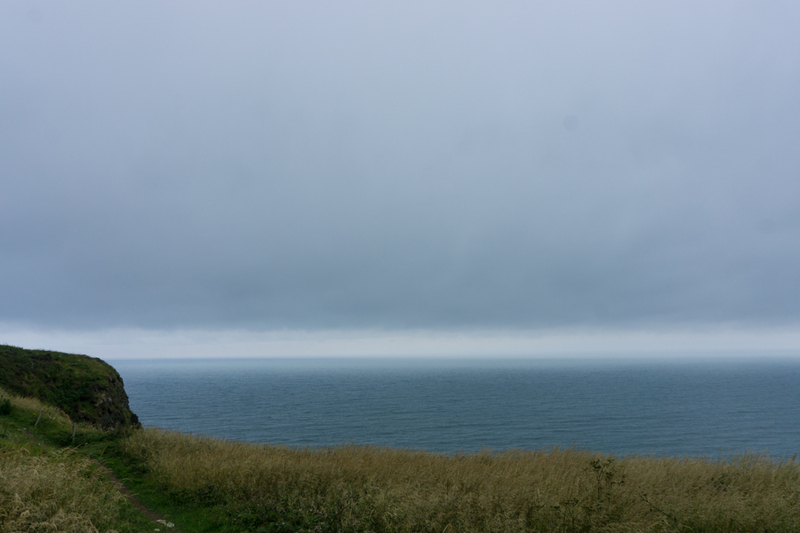 I miss clouds – you probably don’t feel like that in Edinburgh!